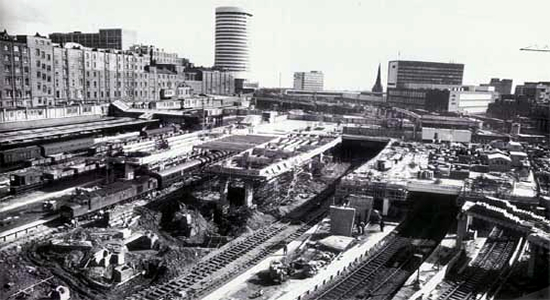 Above-left we see the 'welcoming' entrance to New Street from the car park off Smallbrook Queensway and above-right the view of the actual entrance itself which is roughly to the centre-right of the previous shot. Once through the doors ahead if you walk to your left you enter the main concourse from which stairwells descend to the various platforms. 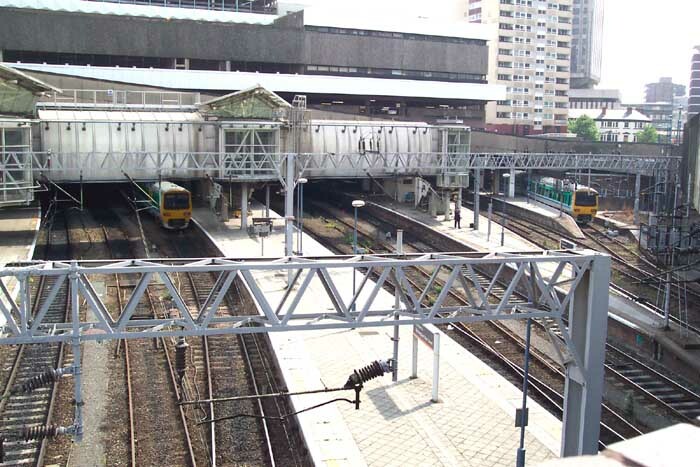 Above-left and above-right are two shots from the same spot (one looking left and one looking right) showing the breadth of the station and the fairly recently constructed concourse over the platforms (not to be confused with the one mentioned above) which was built as the result of safety concerns regarding fire as the station is below ground with only one route out should a disaster strike. As an interesting aside, an overhead gantry carrying signalling cabling did catch fire a few years ago (someone threw a cigarette over one of the walls surrounding the site and it set alight some 'chip wrappers' that had also been thrown over and had lodged in the gantry) knocking-out a large part of the region's rail services as it melted the cabling hence took out all the signalling. 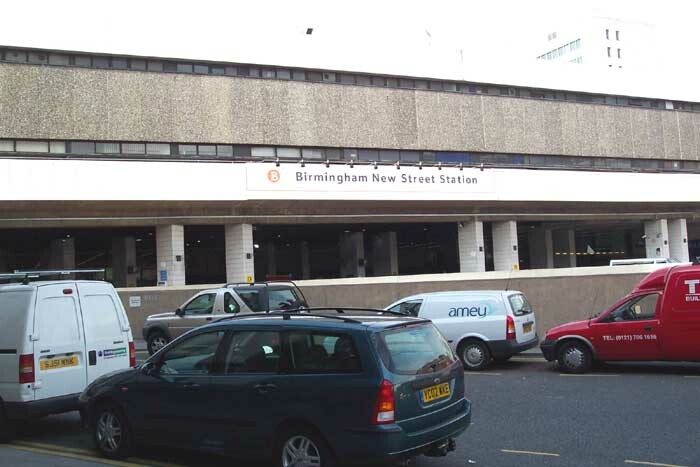 Around the same time it was also reported in the Birmingham Evening Mail that a diesel loco had 'backfired' and set fire to the roof in the station! Other than that, I'm not aware of any serious fire incidents at the station. Above we see the New Street Signal Box on the corner of Navigation Street and Brunel Street. Not a particularly aesthetically pleasing sight but an interesting structure nonetheless! 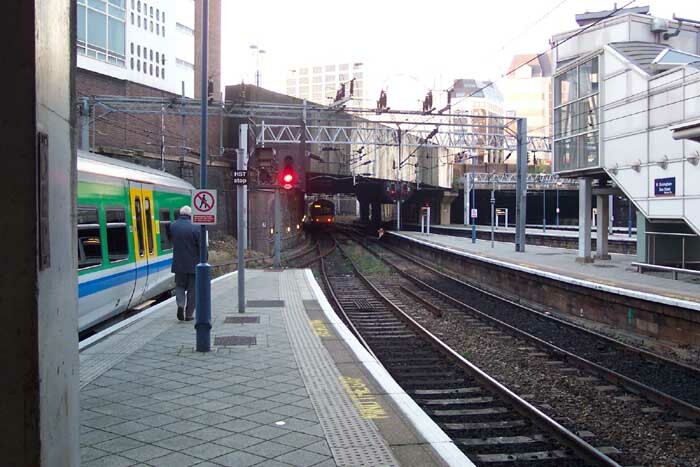 Above-right we are on platform 12B looking towards the Southerly tunnels - straight ahead is the entrance to the tunnels of the cross-city line. Above-left we are still on platform 12B but this time looking to the right of the previous shot. Interestingly, just to the left of centre in the distance can be seen part of the remnants of the LNWR station that is still in use (note the red brick in the distance in the enlarged photograph). 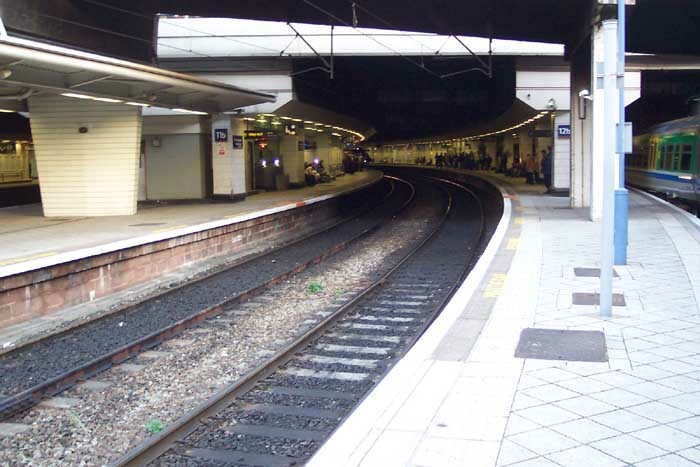 Above-right we are looking back into the gloomy subterranean world of the station from platform 12B. Despite the announcement of several undred million pundes to revamp the station, one ofthe major problems is too many trains and inadequate access: all traffic travelling North out of the station passes through Proof House Junction which, due to its age, was never designed to handle the traffic which uses it today and furthermore, the station itself is entered through a handful of tunnels which again cannot handle the workload today. A drastic overhaul is required as the curren station provides for a very poor state of affairs for the central station of the 'second city' and for the 100,000 commuters who use it every day!